Left: British 40 gun, ref NB28 at Easy Sail. 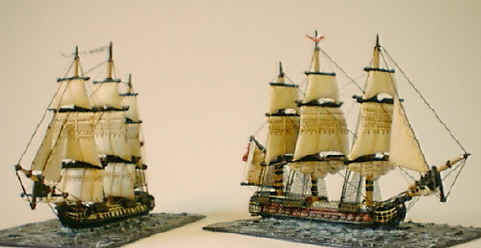 Right: French 36 gun, ref NF7 at Easy Sail with Courses Furled. 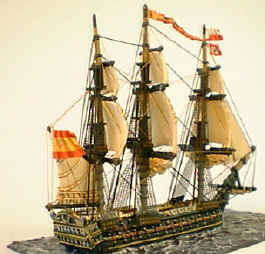 Spanish 74 gun 'at quarters', ref NS4 at Easy Sail with Courses Furled. Note the distinctive colour scheme of black sides with yellow strakes. 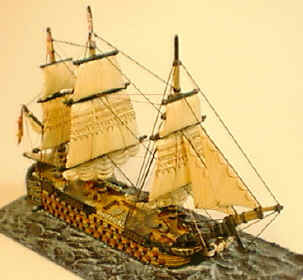 Spanish 112 gun 'at quarters' ref NS10 at Easy Sail with Courses Furled. Showing the front view of the sail setting. 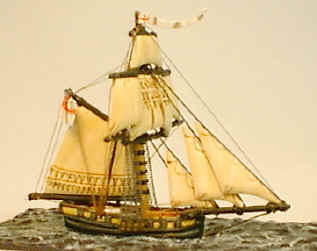 This vessel's sides are painted yellow and the spritsail is furled. CUTTER. 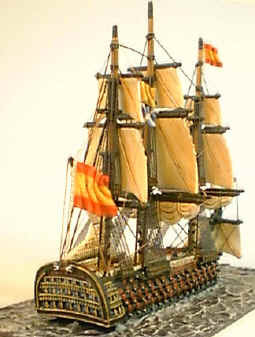 An Unrated Vessel, shown here with Studding Sails set. are now in photo etched brass, 4 thou. click on 'Named Vessels' in the Menu Selection on the left. We will be displaying more photographs in the future.